October is Healthy Workplace Month! Engaged HR is jumpstarting workplace wellness with a five part series on maximizing wellness in the workplace. Last week we kicked off the series with our 6 Tips for Nurturing Work Communities. This week we’re getting back to some basics, and examining how we care for our physical selves in the workplace. 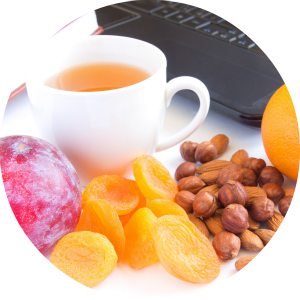 Having our body’s basic needs met is fundamental to our ability to perform well at work. So, how can we make sure everyone at work is comfortable, energetic, and fueled to optimize performance? What we eat either helps or hinders our mental and physical performance. Healthy eating habits increase energy, improve mental focus, increase productivity, and reduce sickness-related absences. And most of us already know what we should and shouldn’t be eating to maximize our energy and performance. It is putting that knowledge into action that is the struggle. Invite the gurus: invite local nutrition experts to come and give a lunch and learn talk about diet and nutrition topics. Many wellness professionals are happy to do this as a publicity tool, so it can be an easy to implement win-win. To simplify snacking, create a snack rotation with coworkers. Minimize monotony by creating a sign-up sheet to determine a group snack schedule. Communal snacking takes some of the burden off of sourcing healthy snacks, and also encourages workplace community building. Click here for some work-friendly snacking ideas to share. You don’t have to start hitting up the gym twice a day to realize benefits from increased physical activity. One of the simplest ways to improve physical wellness is by incorporating more low-intensity physical activity into your workday. Make some of those easy adjustments and encourage your employees to do the same. Can you initiate “Walk to Work Wednesdays?” at your workplace? Challenge employees to walk to work, or take public transit and get off a few stops early once a week. It’s a small commitment, and it all adds up! Avoid “sitting disease” by standing up often, and look for ways to move around the office. Can you walk around while on the phone? Visit a washroom on another floor? Have face to face conversations instead of sending an email or text? Take informal meetings or brainstorming sessions outside. Studies have shown that creativity and problem solving abilities are boosted by increased circulation and oxygen. Create a sign-up sheet for walkers and joggers to connect over their lunch breaks or after work. Being accountable to a buddy makes it much more likely that you’ll lace up those shoes! Or form a team and participate in a fundraiser, adding further incentive to get moving. How comfortable is your physical work environment? Look for alternatives to a traditional desk arrangement, and if you’re in the market for new office fixtures, look for ergonomically correct options. Try bringing a fitness ball to sit on. Taking breaks to sit on a ball instead of a desk chair helps strengthen and tone core muscles, and can be used for other stretches throughout the day. Is a sit-stand desk a possibility? If you’re already standing while you work, try adding a topographic mat to reduce muscle fatigue and strengthen joint-supporting ligaments. Altering the positions you work in regularly supports a fit body now and in the future. Change is harder if you don’t have the tools, so keep your wellness gear close with smart storage. Designate an accessible spot to store healthy snacks and exercise gear. Store basic exercise clothes and some resistance bands at work for days when the energetic impulse strikes. Use reminders: download and post stretching posters or set an alert to remind you to work out the kinks and invite others to join in. Share your wellness resources by starting a wellness library: encourage employees to share books, workout DVDs, recipes and other resources they’ve found helpful. Designate an easily accessible spot in a communal area to facilitate the sharing of healthy habits. We want to hear from you! How does your workplace support exercise and nutrition initiatives?